Martagons are beautiful in the woodland garden setting. They are good companions to hostas and natives. Think of a lily with a strongly upright stem – up to 4 feet tall that can have 30 flowers. The flowers are small and delicate with recurved petals. 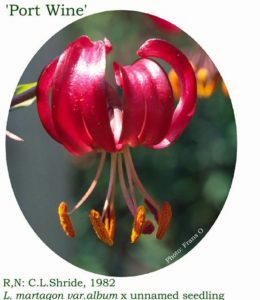 Martagons are the garden lily that matches fairy gardens. They are long-lived and bring bloom to the garden in late June. Why aren’t they in every garden? I expect because they are more expensive than the big, showy lilies. If if you want a bit of magic in the garden this year, consider coming out to the AGM to buy some Port Wine.